ETRN (Extended TURN) is SMTP protocol extension for on-demand mail relay with DNS resolution with fixed IP address. It can be used to release the load of the destination server by using a gateway to filter spam and viruses. ATRN (Authenticated TURN) can be used when the destination server does not have a fixed IP address and/or is not permanently connected to Internet. It is more secure and recommended to be used. The session is initiated by the destination server, which then issues ETRN or, after authentication, ATRN command. 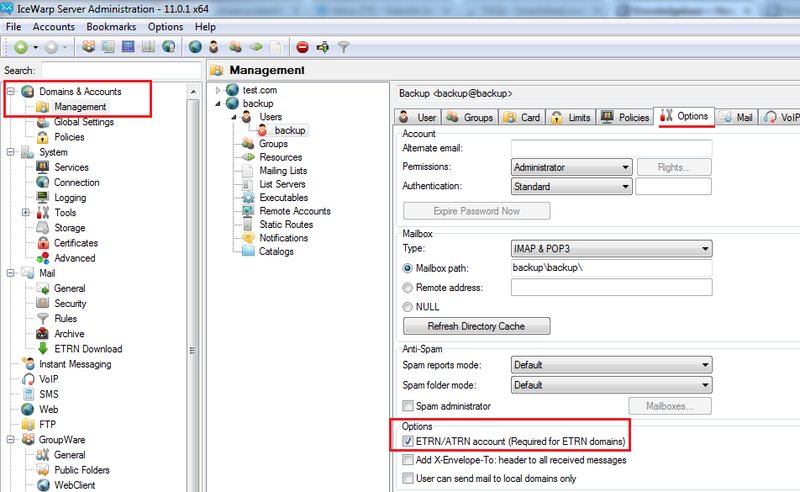 Both, "backup" server and "client" server need to be set up to use ETRN/ATRN. The procedure of execution of this command is: destination server (client in this session, let's call it A) connects to the one (server in this session, let's call it B) that holds mail for it, issues ETRN or ATRN command, they exchange their roles so Bbecomes client and A becomes server. What follows is normal SMTP session with MAIL FROM commands etc. That means, all filters and antivirus are applied by destination server. The first step on the source server setup is to create a domain and set its type to ETRN/ATRN queue domain from Main Menu >Domain & Accounts, create a user that will be set up to work as ETRN/ATRN. Then add one account to this domain which will be used for authentication by the destination server when asking for mail. Password is not mandatory if ETRN will be used, but if set, it will be required from the remote server. This account's login information will be used by the destination server. Now our ETRN/ATRN domain is ready and you can move to the next and final step – configuring the destination server. Here create a new ETRN Download by clicking Add and defining the parameters. If ETRN will be used (destination server has fixed IP address), then "Hostname" will have set a fixed IP address, if the server has dynamic IP, leave this field empty. 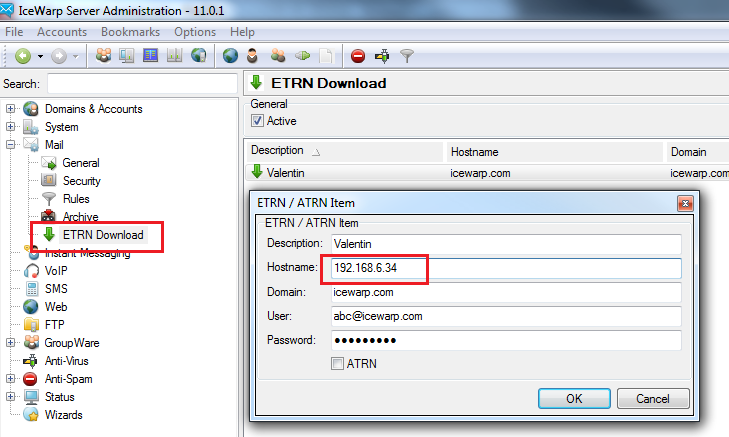 If ATRN needs to be used, check ATRN checkbox from Main Menu > Mail tab > ETRN Download. Parameters for ATRN must be domain name followed by semicolon, login, colon and password. 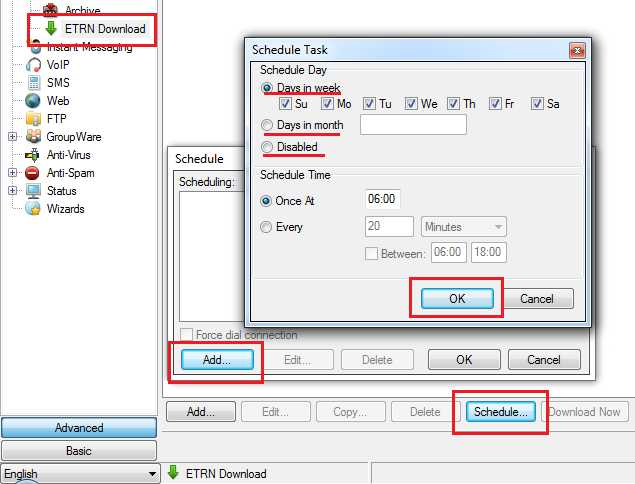 Then just press OK button and, the final step, schedule execution of ETRN/ATRN session(s), like in the given example.